European Conservatives and Reformists posed to be third largest Parliament group, after Belgian Flemish separatist party joins. Belgium's powerful Flemish separatist party joined an anti-European Union (EU) alliance on Thursday, which is led by a British party and may become the third biggest European Parliament group. The New Flemish Alliance (N-VA), which in general elections held May 25 outstripped the country's other parties, won four seats in the next European Parliament at EU elections that took place the same day. The Members of the European Parliament (MEPs) had been thought to be planning to join a center-right Liberal EU parliament group headed by a former Belgian premier, but they surprised the country by signing up with the European Conservatives and Reformists (ECR). The ECR group is mainly made up of anti-EU British Tories and Polish Conservatives, but also includes Germany's fledgling anti-euro Alternative for Germany (AfD), as well as the anti-immigrant Danish People's Party (DF) and far-right Finnish party True Finns. The euroskeptic ECR, which also includes anti-EU Czechs, has rallied support from more than 60 MEPs for the moment, meaning it may become the third biggest group in the new parliament, which holds a first session in July. Britain's increasingly popular euroskeptic leader Nigel Farage meanwhile has also successfully put together a group in the parliament, after winning the support of a French far-right defector. Farage's Europe of Freedom and Democracy (EFD) group will gather 48 members against 31 in the previous European Parliament. Farage's UK Independence Party (UKIP) needed to muster lawmakers from seven European Union countries to announce the formation of a group. The largest contingent is made up of members from UKIP, followed by 17 from the Italian populist 5 Star Movement led by Beppe Grillo. Other MEPs in the group are from Lithuania, the Czech Republic, Sweden, Latvia, as well as France's Joelle Bergeron, who was elected under the banner of Marine Le Pen's French National Front,but who quickly fell out with the party and became an independent. Le Pen is also expected to soon announce the formation of a rival euroskeptic group. Farage had refused to set up a group with Le Pen on the grounds of her party's alleged anti-Semitism. Le Pen so far has been unable to strike an alliance with parties from six other nations to form her own group. But a source said she was close to rallying the support of MEPs from Poland and Bulgaria, as well as the four other parties she had gathered so far. Forming a group not only provides more political visibility and the possibility of chairing various committees, but also between 20 to 30 million euros ($27-41 million) in funding during the parliament's five-year term. 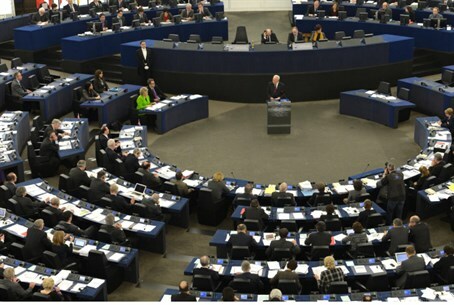 The deadline to form a group in the European Parliament is June 23.